CHOOSING WHICH FISHING CHARTER TO BOOK! Groups of up to four people can be accommodated. Our vessel is fully equipped and safety approved by Transport Canada. 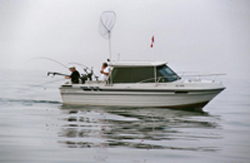 Our aim ... to provide you with a pleasant ontario fishing charter that will leave you with a lifetime of enjoyable memories. Reserve Early! ... And remember, a deposit is required when booking. No matter how well organized we think we are, the chance is we'll forget something! Don't forget to check out the Lake Ontario Fishing Reports page for the latest on fishing conditions, best lures and stories about my daily catch. Good evening Wayne- This is Dionne-my son Kieran and I joined You and Hannes this morning and I wanted to take this opportunity to thank you for your hospitality and inclusion of my son. You will likely never truly know the impact you have made today and for many years to come both for myself and Kieran. I would recommend you to others and thank you for a tremendously successful and enjoyable day. I just want to say hello and THANK YOU for a wonderful time. Your professionalism and skills exceeded our expectations. Even if the weather was bad, you managed to give us a unforgettable fishing trip and to catch fish... Now we have nice memories and a lot of stories to say to our friends here in Montreal. See you next time. I just wanted to thank you very much from the bottom of my heart for the fun fishing trip on July 22nd. That was the best Father's Day gift I have given my dad. I truly enjoyed it! I will most definitely do it again! You are the best!! It was my first time doing a charter fishand it was an absolutely amazing time! You are such a fantastic captain!! Our aim is to provide you with a pleasant great lakes fishing charter that will leave you with a lifetime of enjoyable memories. For your safety and fishing pleasure, our vessels are inspected by the Department of Transport Canada.